Our logo features the Luther Rose stained glass window that can be found in our fellowship hall. It was created by Laura Dillow in fond memory of Mary Kosty, our beloved sister in Christ. The following is an explanation of its meaning. 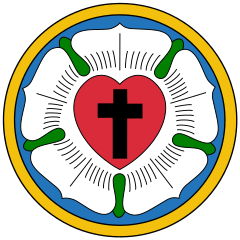 The symbolism of the Luther rose goes back to the 1520s. Luther explained that the red heart with the black cross at the center should remind us that the righteous live by faith in Christ the Crucified. The heart rests on a white rose to show that faith gives joy, comfort and peace. The rose is white, not red, because white is the color of heavenly spirits and angels. The white rose stands in a field of blue, the color of heaven, to show that joy in the spirit and in faith in this life is only the beginning of future heavenly joy. Surrounding the sky-blue field is a gold ring to show that happiness and joy in heaven has no end but lasts forever, just as gold is the highest, most noble and precious metal. May Christ, our dear Lord, be with your spirit until the life to come. Amen.